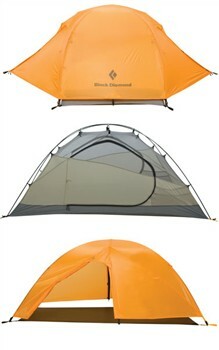 Getting caught in a storm while backpacking can ruin a trip--but not with the Black Diamond Mesa 2 tent . This 2 person, 3 season tent for camping takes seconds to pitch. Praised to no end in online reviews and built for three seasons, but suitable for four, this high quality shelter is just about as good as they come. Like any camping tent on the market, there are people who have specific problems with the Mesa tent, but the detractors can barely be heard over the roar of approving tent reviews from those who swear by it. We here at Camping Tent Reviews are here to separate fact from fiction, to analyze tent specs and reviews, and give you an honest assessment of what works, what doesn't, and what tent will be the best tent for you. Let us say this: The 2 person Mesa tent definitely works. Black Diamond consistently offers some of the best, well-made, and low-priced camping tents and shelters available today. The Mesa is all of those things and more. Quick & Easy Assembly - Bedtime in no time. Dual Side Entrances- No need to step on your tent-mate. Waterproof - Stay dry all night long. But for all the positive attributes of the Mesa, there are some drawbacks. For instance, people who are taller than average may not have the most comfortable night sleeping in this tent (especially if you're sharing the Mesa with a fellow camper). The dimensions of the tent also leave something to be desired by some mountaineers. But whether or not these so-called "disadvantages" are enough to dissuade you from choosing the Black Diamond Mesa 2 tent over other models and brands is up to you. Everyone has different needs and requirements for camping tents, and you'll never truly know which the best tent is for you until you experience it for yourself. The good news is that if you give the Mesa tent a chance, you'll probably never turn back. Floor Size: 7'8" x 4'10"
Vestibule Area: 9 sq ft.
By all accounts, the Black Diamond Mesa is an absolute breeze to assemble. With a hub-wrapped and variable-diameter pole system, this tent practically builds itself. For as big as the Mesa is (32.5 square feet and 44" tall at its peak), it sure packs down into a light and tight bundle. 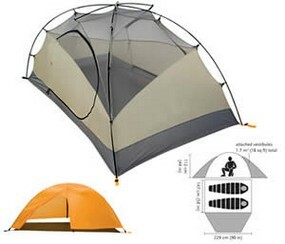 This makes the Mesa one of the most portable 2-person tents for camping and backpacking. The dual side entrances, which are quickly becoming an industry standard, are a great benefit to campers sharing a tent. No longer do you need to worry about disturbing your tent-mate if you have to get up in the middle of the night or wake earlier than he or she does. The Mesa 2 man tent has also been known to withstand a great amount of rain without letting a single drop inside. In one instance, a camper was even caught in a typhoon and still managed to stay dry throughout the night. The biggest complaint about the Mesa 2 person tent (and this even comes from those who otherwise praise this model) is that the two vestibule areas (9 total square feet) are tiny. You can fit a medium-sized pack and your boots out there, but not much (if any) more. Another drawback to this tent (and many, many others) is the interior space (7'8" at its longest and 4'10" at its widest). Campers who are 6'2" or taller may have a hard time fitting well in the tent if they are sharing the space with someone else. The walls of the tent are at such an angle that you really can't use all of the 92" x 58" area,so the small space is made smaller. If, however, you are a taller person camping on your own, you'll find a quick remedy to this issue by sleeping at a slight angle. The Black Diamond Mesa is a truly great 3-season, 2-person tent. It's lightweight, compact, easy to put up, and able to keep you bone dry during even the worst of rainstorms. If you are a taller person, you may want to give this one a test drive before spending good money on it, but you'll probably find that you like the design anyway, even if the vestibules could use a bit more acreage. Bottom line: This is a great tent for a great price (under $320 at Moosejaw.com ), and you'd do well to make it your own. Have you used the Black Diamond Mesa Tent? Share your Black Diamond camping tent reviews and let us know how it worked for you!